It's now November, and the 2017 Black Friday ads are finally starting to roll out. 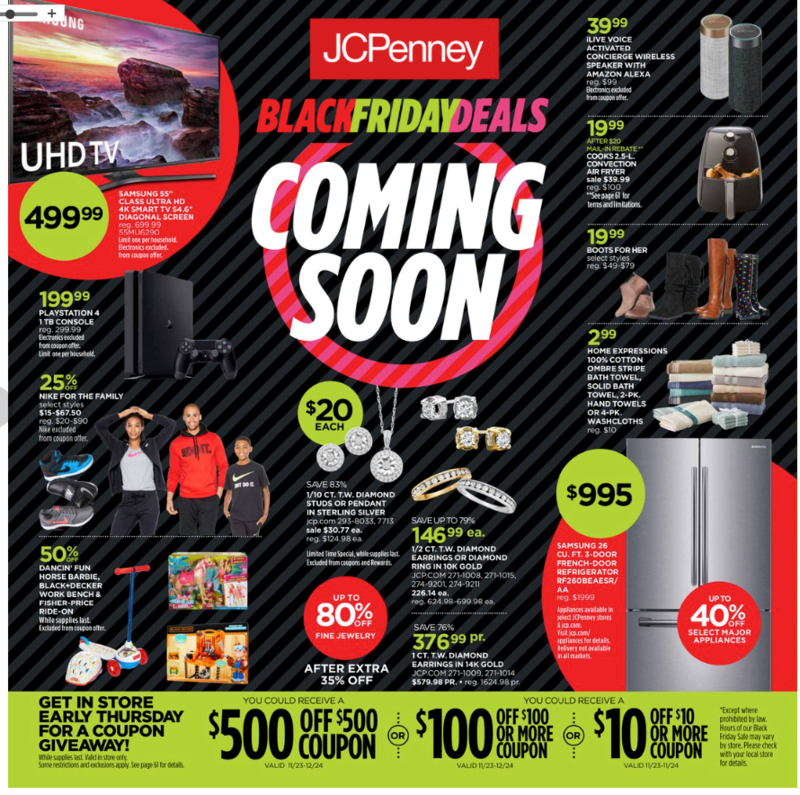 JCPenney has just teased us with a "preview" of its Black Friday deals, implying there are more to come. But this ad still has some great deals for Thanksgiving Day shoppers. At JCPenney, early shoppers Thanksgiving evening will get special coupons, including $10 off a $10 purchase, and a chance to win $100 off a $100 purchase or $500 off a $500 purchase. Typically each store has one or two of those big coupons. While JCPenney is known more for clothing than electronics, it will have some great doorbuster deals on TVs and gaming consoles—and their lines may be shorter than at Best Buy. Opening hours will vary by location, according to the ad, so you will want to check with your local store. In recent years, most JCPenney stores have opened at 6 p.m. on Thanksgiving. According to the ad scan and the website BFAds.net, the best deals at JCPenney include: Samsung 55 inch 4K Smart TV: $499. This is one of the best deals we have seen so far on a top-rated Samsung TV. Playstation 4 1TB console: $199. A good deal, though some other stores are expected to have it for $189, or with more games bundled. Shop around for this one. Samsung 26 cubic-foot French door refrigerator: JCPenney claims this is half price. It's not the biggest three-door fridge you will find, but is a great price for a Samsung. 25 percent off Nike gym shoes Home Expressions towels: $2.99 (regularly $10) Ladies boots: $19 WiFi speaker with Alexa: $39. Note that this is not an Amazon Echo, but a third-party speaker. While it may work fine, note that $29 no-name Android tablets sold every Christmas often do not last very long. If you want an Echo, you may want to pay a little bit more for the real thing. Small appliances: $7.99 after $12 mail in rebate. This would be griddles, mixers, and coffee makers, not small washing machines. But Black Friday is always a great time to grab a new coffee maker. 1.5 quart slow cooker: $4.99 after $5 rebate. This not an official Crock Pot, but if it fails after a year, no big deal. Just throw it out. See the full ad scan at BFAds.com. While JCPenney calls this a "Coming Soon" preview, it appears to be the whole ad, minus some last-minute doorbuster additions.